Montreal, Canada- December 16th, 2010- Montreal based Godin Guitars is getting ready for the upcoming new year with the introduction of a number of exciting and versatile guitar models at this winter’s NAMM show next month. 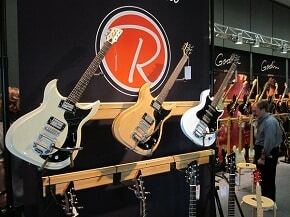 Richmond is the newest brand in the Godin Guitar family and welcomes the hot new Richmond Empire into its fold. It makes its NAMM debut this January and packs a serious “one-two punch” combination…major tone and a very appealing price tag! 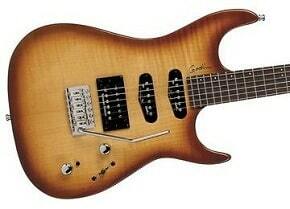 It features a single cutaway solid silver leaf maple body with poplar wings, or the new solid mahogany body design. Other features include a 24 ¾” scale, an ultra comfortable mahogany Ergocut neck with a worn in feel, rosewood fingerboard, high-ratio tuners and a chrome wraparound bridge. The Empire is powered by 2x Godin pickups including a low-noise single-coil in the neck position and a custom humbucker in the bridge. The versatile tones can be controlled by a 3-way toggle switch, 1x volume & 1x tone knob… starting at an incredibly affordable suggested list price of $639.00! (price includes deluxe gig-bag). Made in Canada, the Icon series features four models, which are the company’s first ever set-neck designed guitars. The first 50 of each model will be numbered and will include a special certificate authenticating these models as the original first run of the series. Awaken the “Rock-God” in you with any of the four ICON models available, such as the ICON Type 2 Fat Black, ICON Type 2 Classic, ICON Type 2 Convertible and the ICON Type 3. These guitars feature chambered solid mahogany bodies with carved tops, mahogany set-necks, 24 3/4″ scale, 12″ radius, ebony fingerboards with 22 frets, Graphtech ResoMax bridges and the Godin High-Definition Revoicer system. The Icon Series gives players access to a multitude of stellar rocking tones thanks to various pickup combinations on select models. These include Seymour Duncan P-Rail pickups on the Icon Type2 Convertible, Lollar P90s on the Type 3, as well as Seymour Duncan 59’s and Godin Custom humbuckers on the Type 2 Fat Black and Type 2 Classic models. And now for something completely different… this year is the premier of the Godin MultiOud. Based upon the ancient middle-eastern 11-string instrument called the Oud and inspired by the countless musicians struggling with the issues of tuning and amplifying such an instrument comes the Godin MultiOud. This new Godin Multiac series addition will allow Oud players to be amplified in loud & live band settings for the first time and without feedback. 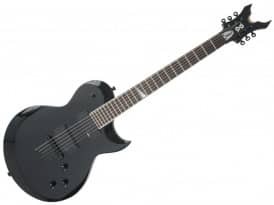 It features custom voiced electronics with bridge & microphone options via an onboard preamp with built-in tuner. Also, as opposed to previous Oud instruments, the MultiOud is a breeze to tune and keep in tune, thanks to specially engineered machine heads by Godin. Truly a fantastic instrument! The ever-popular Godin 5th Avenue series of archtop guitars will see a new addition this year with the 5th Avenue Jazz model. This very elegant instrument was made with the jazz player in mind. It features similar attributes as other 5th Avenue models with the addition of a smooth sounding jazz Godin Mini-humbucker in the neck, ebony fingerboard and stunning high-gloss custom polished finishes, including Piano Black HG and Natural Flame HG. The Godin Progression Boutique USB is the next evolution of the single-coil guitar with a USB output and the added crunch of a Godin custom humbucker in the bridge. It features all the “slap & spank” you’ll ever need, as well as extremely consistent volume output between the Godin GS-2 pickups and the unexpected power that you wouldn’t expect from a single-coil guitar. The Progression combines a 25 1/2″ scale neck with the added snap of a rock maple neck with rosewood or maple fingerboards, along with the added bonus of the High-Definition Revoicer and the USB output for direct and easy computer access, making it ideal for recording! Visit Godin Guitars at Winter NAMM in Room 211A. Be sure to stop in to the Godin showroom for other new additions in the Godin Multiac series, the metal-minded Redline series and a number of new offerings from Godin’s acoustic lines such as Seagull and Simon & Patrick. Including the new Seagull Entourage CW EQ in a Rustic Burst GT and Burgundy GT finish. The Simon & Patrick line see the introduction of the all solid wood S&P Woodland Pro Folk Burst with slotted headstock and the Woodland Pro Parlor Burst guitars.